Android vs iPhone - Which one should I get? | Android Blast! Android Blast! > Reviews > Android vs iPhone - Which one should I get? Android vs iPhone - Which one should I get? As Google sells more and more Android phones, and the Android Market gathers more and more apps, the question becomes more pressing. Android or iPhone? They're both great platforms and the answer has nothing to do with one being better than the other. Apple has a head start in the smartphone game because they launched the iPhone 3 years ago. Sure there were lots of Windows and Palm based smartphones before 2007, but the popularity of the devices just wasn't there yet. Apple convinced a bunch of people to adopt their platform and then Google jumped into the mix in a big way. Now it's a neck and neck race between two fantastic companies, both with very nice offerings. The iPhone is such an elegant and powerful devices, but with the Motorola X, Droid, HTC EVO, and Samsung Epic releases, the choice gets difficult. If you compare the smartphone wars to the PC wars, you could say that Google is the new Microsoft and Apple, we'll they're still Apple. Remember when Apple made their own hardware to run their software and it was really cool, but they only had like 5% of the market? The smartphone wars look like it's heading in that direction. Google's Android OS is an open platform that will be on hundreds of handsets, while there is only one iPhone. Apple had a head start so they have about 25% of the market right now, but Google will take them over. So which one is better? That depends on what you want to be able to do. The short answer is something like this: Android phones are computers, but the iPhone is an appliance. That is, if you're the kind of person who likes to tweak your phone and make it do all kinds of crazy things and you consider yourself a tech geek, you're probably and Android person. If you just want to turn it on and have it do its thing, then you're probably in for an iPhone. I know that is a huge over simplification, but it's true. iPhone users like to hack their phones too, but Apple puts so many restrictions on the iPhone to make it operate smoothly that it can be frustrating for a geek. iOS is more refined than Android, but give Google about another year and they'll catch up with Apple. Android has some very unique features that integrate very well with Google services. Take the recently released "Chrome to Phone" app that allows you to send links, videos, and maps from your desktop computer to your phone. You can't do that with an iPhone. What about an app to back up your SMS messages right to your Gmail account? Yep, Android has that too. The iPhone brings a gorgeous elegant display and a fantastic multimedia experience. The iPhone is easy to use and straight forward. So if you're asking yourself, "which smartphone should I get? 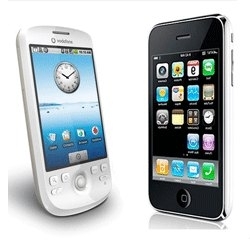 iPhone or Droid?" Just determine if you're a geek or not and then your decision will be easy.